Thank you to our friends at Equis Hotels and Hilton for presenting us with a $4,000 grant to support our mission. This grant specifically focuses on ensuring that our 9th through 12th grade Littles graduate from high school fully prepared for their next step as they enroll in college or trade school, enlist in the military or become gainfully employed. Thank you for this investment in the future of kids and the community! 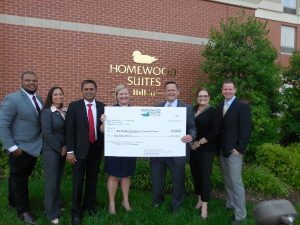 In the photo, from left, are Steven Hunt, Assistant General Manager; Jasmine Kumar, Director of Sales; Mohammed Kashif, Corporate Director of Operations and Big Brother; Jodi Woessner, BBBSEMO Chief Resource Officer; Michael Mullenix, President and CEO of Equis Hotels; Lori Sweazey, General Manager; and Conor Pandl, Corporate Vice President for Equis Hotels.